Edwin Lynn Wolff came to the end of his life’s adventures on February 23, 2017, aged 92. He died comfortably at his home at The Academy in Boulder, Colorado. He was born in New York City on November 26, 1924 to Samuel Edwin Wolff and Adeline Moses Wolff. After a short period in Tulsa, the family relocated to Savannah where he spent his boyhood. He attended Phillips Exeter Academy and Yale University. Service in the US Army Air Corps as a meteorologist diverted him from various studies at Yale. After WWII, he returned to Yale, graduating with a Bachelor’s Degree in History in 1950. He pursued further studies at the University of California, Berkeley, earning a Master’s degree in English Literature. Upon graduation, Ed returned to the east coast to work for the Democratic National Committee during the 1954 elections. He then signed on as a reporter, working for a newspaper in Bayonne, New Jersey. While there he met his first wife. He then headed west to Colorado having landed a job as staff reporter and editorial writer for the Denver Post. A 1961 assignment for the Post was a watershed event for Ed. He was assigned to write a story about the National Center for Atmospheric Research (NCAR) in Boulder. Dr. Walter Orr Roberts, who was NCAR’s first director, was his main source for the article. According to Ed, Roberts paid him “the greatest compliment for anything I’d ever written” by offering Ed a post in NCAR’s executive office. He remained at NCAR until his retirement 27 years later. 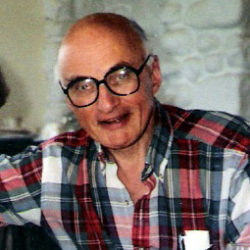 At NCAR, he also met his second wife Mary Andrews Wolff. They were married in 1963 and remained so until Ed’s death. Mary and Ed worked together with architect I.M. Pei as he planned the NCAR Mesa Lab that was later built in south Boulder near the Flatirons. Also, they were part of the team that edited “Remembering Walt Roberts”, published in 1992. An earlier assignment found Ed learning to ski in Aspen, at the paper’s expense. This, along with his meteorology training sparked a love of the outdoors. Ed became an avid hiker, backpacker, cyclist, and runner. He hiked to the bottom of the Grand Canyon, ran in the Bolder Boulder while in his 80’s, and cycled extensively with Mary in Colorado, Canada, Ireland, England, and France. Music was always a passion of Ed’s. He began singing and arranging music at Yale and continued to write and study music throughout his life. While at Yale, he performed with the Whiffenpoofs and the Glee Club. Later, Ed was one of the founding members New Wizard Oil Combination, a men’s singing group performing in the Boulder-Denver area. After retiring from NCAR, Ed returned to studying music with a focus on composition. Ed’s musical writings encompass several hundred arrangements for a capella vocal groups of various sizes, compositions of chamber music, songs for solo voice, and a piece written for the aforementioned Wizards and the Boulder Philharmonic. His arrangements and compositions have also been performed by various groups across the country. Ed also served as President of the Board of both the Boulder Philharmonic and the Colorado Music Festival. He is survived by his wife Mary; children Elizabeth Wolff, Robert Wolff and wife Allison; stepchildren Linda Andrews Cowan and husband Jeff, Kent Andrews and wife Leslie Winter, and Lesley Andrews and wife Mariko Hirano; grandchildren Jason Andrews and wife Stephanie, Siri Soule and husband Thomas, Ethan Cowan, Léma Andrews-Hirano, Soren Winter, and four great-grandchildren. In lieu of flowers, please consider donations to The Colorado Music Festival, or the University of Colorado College of Music. A celebration of life will take place on June 11, 2017 at 10:30 am in the Chapel at The Academy, 970 Aurora Avenue, Boulder. All are welcome (paisley clothing optional).